The original Pokemon tracking system in Pokemon Go was serviceable at best. The unofficially called “footprints” tracking system did not point the exact location of Pokemon. But at least it showed whether you’re in the right direction or not – the footprints would increase or decrease to indicate if you’re getting nearer to the Pokemon you’re hunting. Well, at least that’s how Niantic intended it to be. It was marred with errors and bugs right from the start, which eventually led to it being shut down for good. Niantic replaced it with the “Sightings” feature, a completely useless tracking system which did more harm than good. 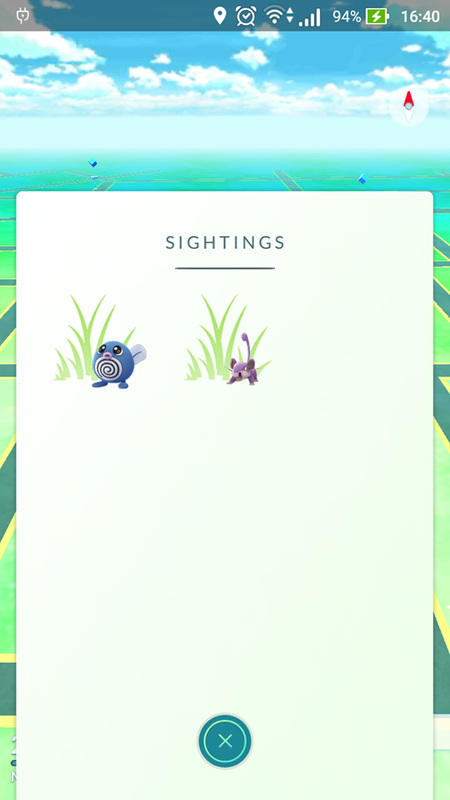 The Sightings feature stuck with the game until recently when Niantic finally rolled out the all-new “Nearby” tracking system. But before we get into that, let’s take a look at the Sightings feature first to better appreciate the new Nearby feature. This feature works by simply showing the Pokemon within a set radius. It doesn’t show if an all-powerful Psychic Pokemon is situated farther to the north or a little bit to the east. It just shows which Pokemon are near your location. This caused players to walk aimlessly, hoping they’re in the right direction. If the Pokemon you’re chasing disappears from the Sightings feature while you’re moving, it means you’re going the wrong way. As if it couldn’t get any worse, Niantic even lowered the radius of the Sightings feature, which made it even more useless. Originally, it had a 200m radius. Niantic cut it down to a laughable 50m, before bringing it back up to 200m again recently. In any case, the Sightings feature wasn’t useful to begin with, which prompted third-party developers to come up with more useful tracking systems. Sadly, Niantic took them out of the game, although they had a valid reason to do so (security risks). 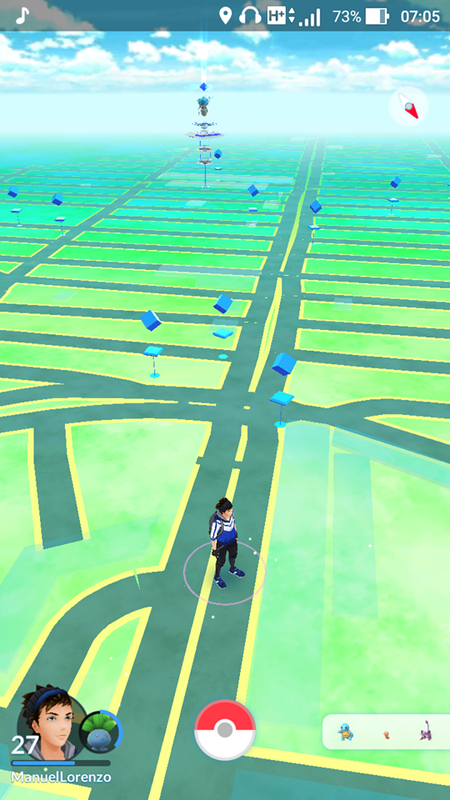 The Nearby feature was originally available only to players living in San Francisco, California. It was a sort of region-locked beta testing, so to speak. But after a few months of tinkering with the new tracking system, Niantic finally started rolling it out to more locations gradually. Now, it’s available in Europe and many other locations including Asia. It was probably a good move for Niantic to activate it in more locations before 2016 ends. They probably don’t want to start off 2017 with a mountain of complaints from players about the lack of a useful tracking system. The Nearby feature works in conjunction with PokeStops. 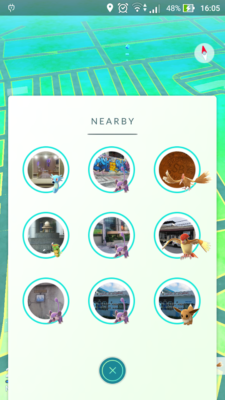 The Nearby tab shows pictures of PokeStops near your location, with each PokeStop accompanied by a picture of a Pokemon that’s near or at the location, hence the “nearby” term. Tapping a picture of a PokeStop brings up a map which shows the location of that PokeStop in case you’re unfamiliar with it. This effectively shows the exact location of Pokemon. You simply head over to the specified PokeStop and wait for the Pokemon to spawn. This makes it relatively easier to hunt rare Pokemon like the Dragon Pokemon. Of course, the Nearby feature doesn’t guarantee an immediate encounter as soon as you arrive. You may have to wait for a bit. But in the meantime, you can stock up on free items from the PokeStop. It’s a double win, right? The most obvious disadvantage of the Nearby feature is that it’s practically useless if there are no PokeStops near your location. Meaning, players living in rural areas where PokeStops are few would find it hard to get excited about the Nearby feature. Hopefully, Niantic makes a few tweaks down the road to make the new tracker better suited for players not living in big cities. 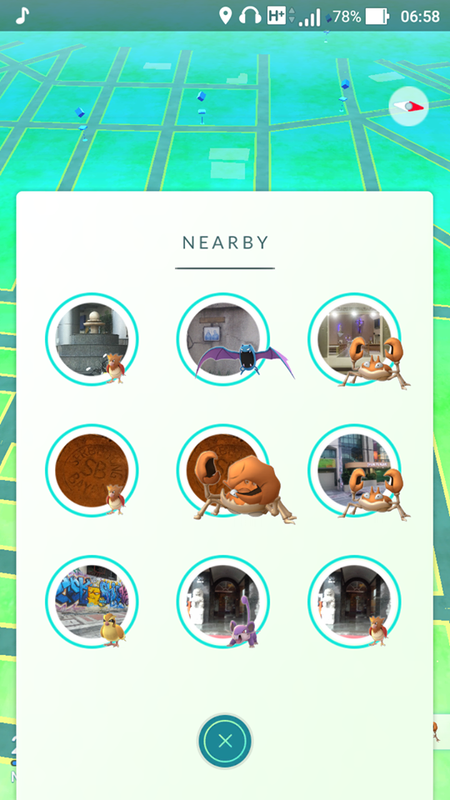 The new Nearby feature does not signal the end for the Sightings feature – it’s still in the game. You see, Niantic made a few changes to the Nearby feature before activating it in more locations. The Nearby feature will only pop up when you’re near a PokeStop. If there are no PokeStops in sight, the Sightings feature will take over as the game’s main tracking system. Apparently, this is automatic. You can’t toggle between Nearby and Sightings manually from the settings. This isn’t really an inconvenience, but players don’t like things which they don’t have full control over. It’s probably more intended for players living in rural areas. If Niantic pulls the plug on the Sightings feature, such players would be practically blind when hunting for Pokemon. The Nearby feature is more useful than both the original footprints and Sightings tracking systems. At least now you know which direction to run off to, instead of walking around aimlessly. However, when the other generations arrive in Pokemon Go, things could get crowded for the Nearby feature. To circumvent this, Niantic could add an option that controls which generation of Pokemon appears in the Nearby feature. For example, if you toggle a first-gen option, it will only show Pokemon from the first-gen Pokedex (001-151). That would narrow down the field. Of course, there’s the potential to miss out on nearby Pokemon from other generations while you’re busy with another. But if the Nearby feature is too crowded, it would have the same effect. Just like choosing a Champion in League of Legends, it can be hard to pick one among numerous choices. The Nearby feature is still in its infancy, though. Niantic might not make major changes until they’ve seen the new tracker in action for several months. So far, the Nearby feature has been received warmly by players, which shouldn’t be a surprise considering the Sightings feature wasn’t really much help at all. However, if you simply don’t like walking around for hours hunting for Pokemon, you can simply have someone catch them for you. You can also buy a Pokemon Go account which already has the Pokemon you want – even the recently released Baby Pokemon. And speaking of which, the new Nearby feature doesn’t up your chances of acquiring a Baby Pokemon – they’re exclusive to Pokemon eggs. But don’t worry; the Baby Pokemon aren’t especially noteworthy. They’re just in the game for cuteness purposes.